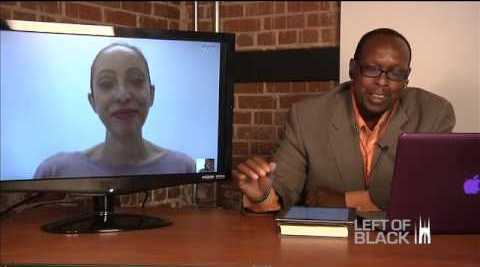 Mark Anthony Neal interviews guest on Left of Black webcast. Years from now, when we're thinking about shifts and innovations in black intellectual history and we look back on this current moment, we'll mention the work that Mark Anthony Neal was doing with his NewBlackMan site and webcast Left of Black, where he interviews a wide range scholars on their work and notable topics of the day. Similar to Alondra Nelson, we'll likely recognize Neal's work as a vibrant convergence of technology and black studies. Neal first became widely known as a writer and commentator on popular culture, African American music, and cultural history. His book What the Music Said: Black Popular Music and Black Public Culture appeared in 1998, and later he published Soul Babies: Black Popular Culture and the Post-Soul Aesthetic (2002) and Songs in the Key of Black Life: A Rhythm and Blues Nation (2003). In 2004, with Murray Forman, he edited That's the Joint! : The Hip-Hop Studies Reader, and in 2005, his book New Black Man was published. His next book, Looking for Leroy: Illegible Black Masculinities will appear in April. Whether we label Neal's current online activities as "digital humanities or afrofuturism," his projects surely make him a notable model for what a resourceful, creative intellectual can achieve with technology and the inclination to bring various thinkers together. For years now, Neal has run a blog site NewBlackMan, where he presents his ideas on a range of topics including music, film, cultural politics, and African American history, and he regularly includes a diverse group of guest contributors. At Duke University, where Neal is a professor of African and African American Studies, he has hosted dozens of artists, scholars, and notable cultural figures for the popular Left of Black series, and just last year, he organized the successful "Black Thought 2.0: New Media and the Future of Black Studies." No doubt, Mark Anthony Neal's projects and activities can serve as useful blueprints for our future programming.